This is our weekend go-to brunch dish. It is super easy and simple to make, but loaded with tons of flavor. My husband and I love it so much that we had it as breakfast four days straight during Christmas holiday week. And we still love it. There is a local farm near us that produces awesome yellow potatoes. They come to sell potatoes at local farmer’s market every Wednesday and Saturday. I always buy potatoes from them. When the farmer’s market closed up at the end of October, I bought two buckets of potatoes and stored them in the fridge. I thought they should last the whole winter. Well, I was wrong. They are almost gone in less than 2 months. Cut the bacon into bite size. Clean and rinse the potatoes. No need to peel them. Crispy potato skin is a big plus in flavor town. Heat a cast iron skillet (from amazon)over medium heat. Add bacon. Cook until it becomes golden and crispy. Get them out with a thong. 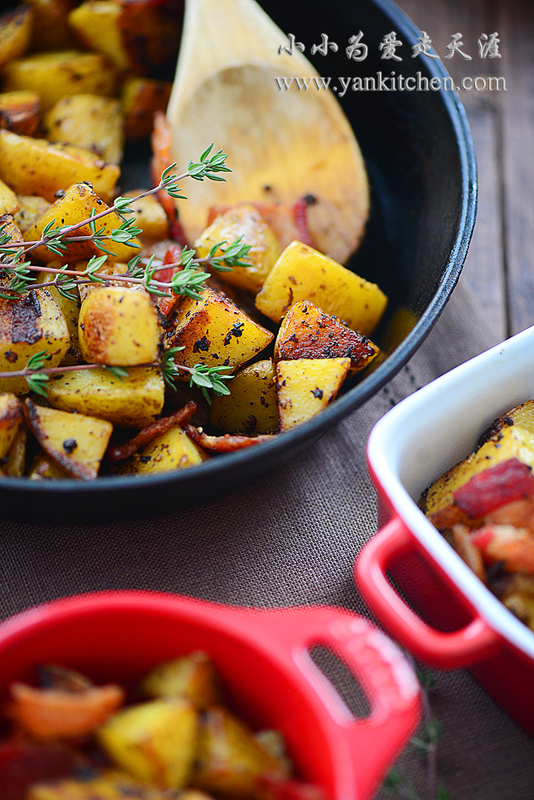 Add potatoes to the skillet with bacon fat. Cook over medium heat. Add salt, black pepper, minced garlic and thyme. 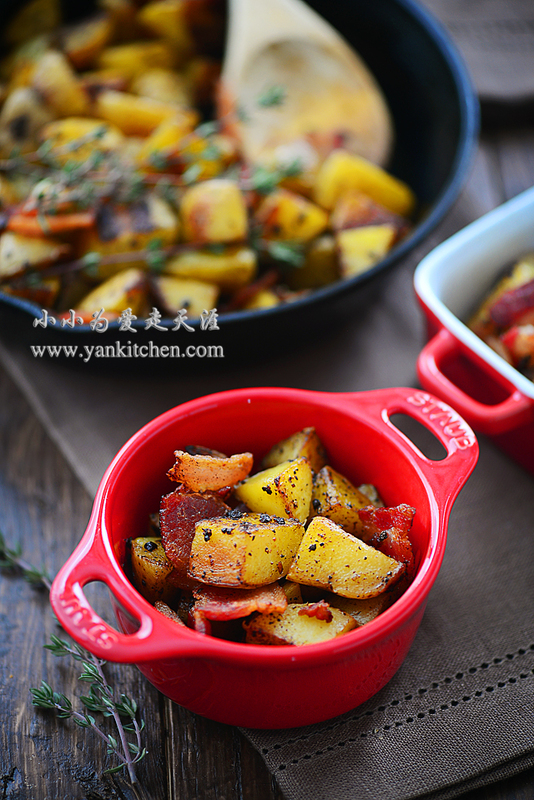 Cover; cook until potatoes are cooked through and the outsides become gold and crispy too. Discard the thyme. It is indeed a simple and tasty dish. Remember to flip potatoes from time to time. It will help prevent them sticking to the bottom because potatoes contain high amount of starch.